Description: after seeing train after train of either a single dash-9, or grimy old SD's, a BNSF ES44DC is a welcome visitor to CP's Detroit Lakes sub...here in Parkers Prairie, Mn, also, is that a pheasant hitching a ride on the plow? Description: A pretty clean 6049 trails todays train. Description: Two CPs and a Soo SD60 wait for route to Saint Paul at Freight House Crossing on a winter afternoon. Description: Train 183 has a new set of SD40-2's for power today. Train 493 is sitting down at Marshall St, and 183 will be about 2 cars away from the hind end after making this move. Description: D&H 258 thunders towards CPF-631 with a short train in tow behind a quartet of SD40-2s. Description: D&H 258 approaches the first crossing south of CPF-631 behind a colorful consist. Description: D&H 258 rounds a hill as it climbs out of New Milford, PA. Description: After shoving down the NS floodwall tracks for interchange with the Louisville & Indiana, the power on an INRD potash train cuts off and heads for NS's Youngtown Yard. 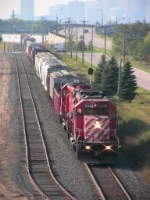 Description: CP 6049 sits stored at Saint Paul with another CP SD40-2 and two Soo GP38-2s. Description: After catching this train at Cardigan Jct, I headed over to Humboldt to get some more shots. Here it is seen getting ready to get onto R1 at Humboldt Yard. Its not everyday you see two CP SD40-2s together. Description: A Dresser Turn comes into Cardigan Jct so it can meet the WC at Victoria St. CP 5747 trails. Description: CP 5747 throttles up after hitting the diamonds at New Brighton as it brings a train of emptys to be loaded at Dresser. Description: The West end of Humboldt is bustling this afternoon. These two matched Dueces are flat switching while a road train waits to head West. 198 is just across the Mississippi at Shoreham as well. Description: CP Ballast train 961 rolls through Winona during a downpour. Even with the terrible weather I couldnt miss some SD40-2s. Description: A wonderful train, and under powered, screams by Vermillion with its K3 singing and in Notch 8. And Notch 8 is where they would stay for most of the trip, struggling to keep track speed. Description: Coming into Frontenac still struggling to maintain track speed, but able to lay off of the throttle a little to let the old 16-645 cool off a bit, the pair of Dueces continue their trip East under low and heavy clouds that have turned into more fog than anything. Description: Another early morning HAT finds two of the regulars, but an unusually large train. Description: Tada! The HAT has the same two SD40-2's again, but since they have three others along for the ride I decided to shoot it anyway. Description: The HAT comes back to Humboldt with a nice set of CP SD40-2s for power. Description: K803 passes through the open fields south of Columbus Grove. (Note the strobe light on top of SOO 6022). Title: CP 6049-6050, CP's River Sub.